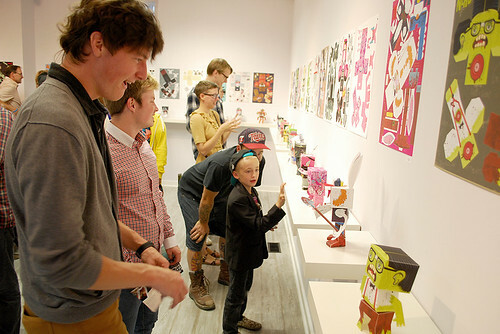 Night of the Exquisite Corpse opened with an exciting reception this past Friday! A horde of guests were greeted by an appropriately ghoulish soundtrack as they marveled at each of expertly crafted, undead themed paper toys. It was a fun and high-energy exhibition and we had a fantastic turn out! We want to thank everyone that was involved, from near and far, for all of their hard work and enthusiasm for the show! Be sure to check out all the pics on our flickr gallery! Besides getting a good feel for the vibe of the show, you can check out some artists posing with their pieces (sorry we didn't catch everyone, though!). 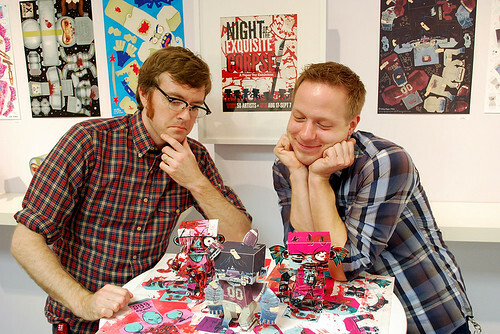 Big thanks to Chris Schons and Adam Hoppus, who co-curated the show! They poured time, blood, sweat and tears into brainstorming, planning, assembling and coding. Adam painstakingly cut out and assembled each of the three dimensional pieces on display, and Chris created this amazing interactive gallery! Stop by www.zombioso.com to see all the entires and mix and match some zombies! 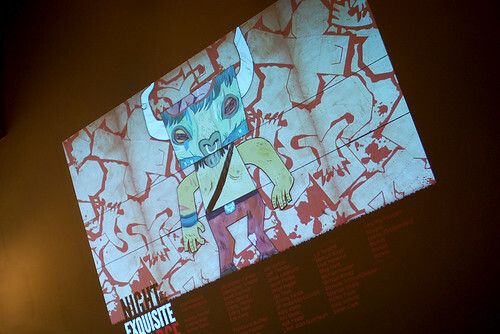 Night of the Exquisite Corpse will be on display at Light Grey Art Lab through September 7, so please stop by! They are amazing in person! For those who can't make it to Minneapolis to see the show, don't worry, we have you covered! Check out our our online shop where you can see all the assembled pieces as well as the flat artwork! And of course you can order any you'd like to build yourself! And again, please visit zombioso.com to see the interactive gallery of all of the pieces listed by artist - with a special zombie-swap feature that also lets you see what they look like when pieces are interchanged!